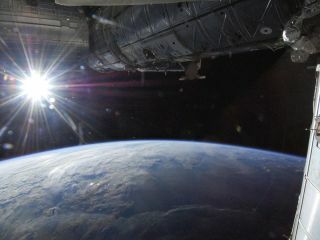 The sun is captured in a "starburst" mode over Earth's horizon by one of the Expedition 36 crew members aboard the International Space Station, as the orbital outpost was above a point in southwestern Minnesota on May 21, 2013. The Earth is as far from the sun as possible for the year today (July 5), but that may come as a surprise for people baking in a heat wave affecting nine western states, with temperatures at or above 100 expected across much of Southern California, southern Nevada and southern Arizona. Of course, scorching heat has blistered most of the Southwest in recent days where highs of 115 to120 degrees over parts of Arizona, Nevada and California occurred this past weekend; the temperature at California's Death Valley actually approached 130 degrees. If you ask most people in which month of the year they believe that the Earth is closest to the sun most probably would say we’re closest during June, July or August. But our warm weather doesn't relate to our distance from the sun. It's because of the 23.5-degree tilt of the Earth's axis that the sun is above the horizon for different lengths of time at different seasons. The tilt determines whether the sun's rays strike us at a low angle or more directly. At the latitude of Chicago for instance, the more nearly direct rays at the summer solstice of June 21 bring about three times as much heat as the more slanting rays at the winter solstice on Dec. 21. Heat received by any region is dependent on the length of daylight and the angle of the sun above the horizon. Hence the noticeable differences in temperatures that are registered over different parts of the world. It would seem logical to assume that because Earth is farthest from the sun in the July and closest in December, that such a difference would tend to warm the winter and cool the summer … at least in the Northern Hemisphere. The seasons are reversed in the Southern Hemisphere, where winter is currently under way. And yet the truth of the matter is that the preponderance of large land masses in the Northern Hemisphere works the other way and actually tends to make the winters colder and the summers hotter. Interestingly, the times when the Earth lies at its closest and farthest points from the sun roughly coincide with two significant U.S. holidays. We're closest to the sun around New Year's Day and farthest from the sun around Independence Day. Actually, depending on the year, the date of perihelion can vary from Jan. 1 to 5; the date of aphelion can vary from July 2 to July 6. Joe Rao serves as an instructor and guest lecturer at New York's Hayden Planetarium. He writes about astronomy for Natural History magazine, the Farmer's Almanac and other publications, and he is also an on-camera meteorologist for News 12 Westchester, N.Y. Follow us on Twitter, Facebook and Google+. Original article on SPACE.com.